Think of a SQLSaturday as a one day conference. We bring in a lot of volunteer speakers, we have lunch on site and we have a dedicated area set up for our attendees to meet with our sponsors. We work hard to make our event a great experience for everyone, especially our sponsors that enable us to cover the working costs of this free training day. This year we will organize 2 SQLSaturday’s in Germany, the SQLSaturday Rheinland in St. Augustin (between Cologne and Bonn) and the SQLSaturday Munich. At each of the events, we’re expecting between 250 and 300 attendees! If you would like information about an individual sponsor pan, please email us. All prices are subject to VAT and must be paid in advance. We’ll email you an invoice that can be paid via PayPal or check. German „Doppelpack“All fees must be paid in advance. To register as a sponsor just visit https://www.sqlsaturday.com/760/Sponsors/SponsorSignup.aspx and fill out our sponsorship registration form. We’ll email you an invoice that can be paid via PayPal or check. 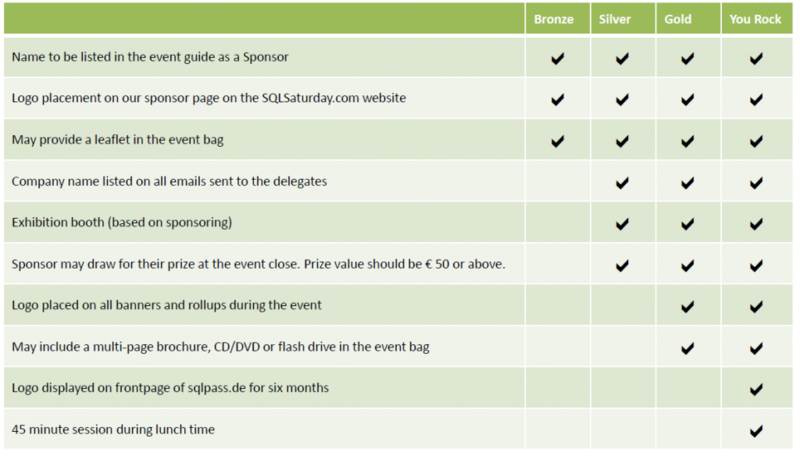 Decide now to sponsor this year both SQLSaturday’s in Germany and you can save money and get extra advertising. If you would like information about an individual sponsor plan (Attendee T-Shirts, Breakfast) please email us. German Doppelpack -> Enter “German Doppelpack” in the comments-section!